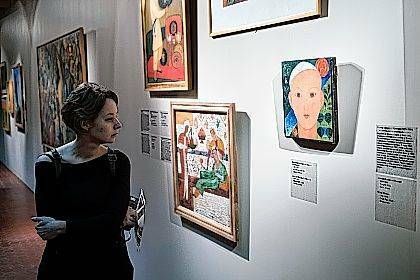 In this photo taken on April 6, visitors attend the exhibition of renowned avant-garde collection from the Savitsky State Art Museum of Karakalpakstan in Uzbekistan, opened in the Pushkin Fine Arts Museum in Moscow, Russia. 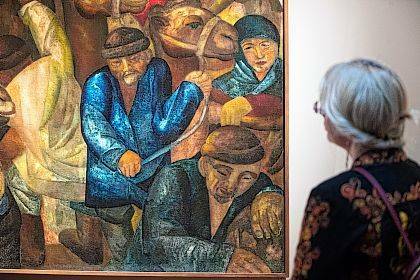 More than 200 paintings from the Savitsky State Art Museum of Karakalpakstan went on display in Moscow, a rare traveling exhibit from the gallery widely regarded as having the world’s second-best collection of Soviet avant-garde art. MOSCOW (AP) — Vladimir Lysenko’s painted bull stares with flat black eyes like a double-barrel shotgun, one of his horns festooned in a mosaic of bright rectangles, the tip of his tail stretched toward a glowing orange globe that may be the sun. In the 1950s, painter Igor Savitsky got work in an archaeological expedition in Uzbekistan. He became fascinated by the intricate weavings and elegant pottery of the local Karakalpak ethnic group and collected their art extensively. Local officials, flattered by his interest, helped him establish a museum in the city of Nukus. Savitsky also was concerned about the fate of the works of the Soviet Union’s more adventurous artists. In the early 20th century, Russia had been a hotbed of bold art experimental movements — Suprematism, Luminism, Constructivism — as well as visions too idiosyncratic to fit into any category. But by the early 1930s, authorities decreed that art must express Soviet ideals and be comprehensible to the average worker. Bold colors, dancing polygons and strange faces disappeared from the public view, replaced by muscular construction workers and children devotedly presenting bouquets to Soviet leader Josef Stalin. Artists unwilling to conform were denounced as “formalists” who valued aesthetics over ideology, and some suffered severe repression. Lysenko was arrested in 1935 and although he was recorded as showing some paintings in the 1940s, little else is reported of his work. He is believed to have died sometime in the 1950s. Alexander Nikolaev, whose “Way of Life” is the main emblem of the exhibit’s advertising, also was arrested. The painting shows a young man in a skullcap staring as if in a trance, against a nearly abstract background of trees and a river. Savitsky began collecting as much of the “unofficial” Soviet art as he could, reportedly filling train sleeping compartments with paintings to bring them to Nukus, some 2,000 kilometers (1,200 miles) from Moscow. Many of the works likely would have been destroyed or deteriorated irreparably if he had not been able to spirit them away to a city far from the central government’s attention. “He collected works without taking into consideration whether this was a well-known name or not well-known. He collected art with an orientation on the art itself,” said curator Irina Kim. The collection’s hometown of Nukus has little else to please the eye. By some measures it’s the world’s dustiest city, plagued by storms of chemical-tainted sand blowing from the disappearing Aral Sea. The more elegant environs of the Pushkin Museum are conducive to contemplating the works, and appreciating why many of them would offend conformism-obsessed Soviet censors. One of Ural Tansykbayev’s works nominally celebrates the cotton fields that are Uzbekistan’s mainstay, but the dominant element is the nearby road colored vivid purple and rising from the bottom of the frame like a shrouded figure. Kliment Redko’s painting “Motherhood” might work as a Soviet-acceptable portrait of a peasant and her son, except that the mother is helping the son urinate. “Some of the paintings give indelible impressions, which is why I think this a huge event. Personally, I am in complete awe,” said viewer Alla Tiligina. https://www.limaohio.com/wp-content/uploads/sites/54/2017/04/web1_116204816-adab606f9af740868791d01aaf515380.jpgIn this photo taken on April 6, visitors attend the exhibition of renowned avant-garde collection from the Savitsky State Art Museum of Karakalpakstan in Uzbekistan, opened in the Pushkin Fine Arts Museum in Moscow, Russia. 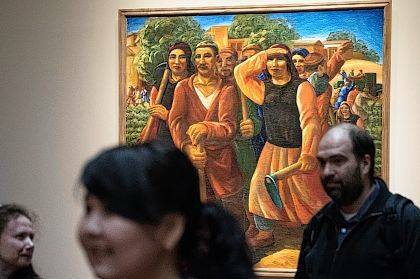 More than 200 paintings from the Savitsky State Art Museum of Karakalpakstan went on display in Moscow, a rare traveling exhibit from the gallery widely regarded as having the world’s second-best collection of Soviet avant-garde art.